There is always so much to be thankful for this time of year – and November 2015 was certainly no exception! Before we settled down for Turkey Day, JAF spent most of the past month preparing for our eighth annual gala, recruiting runners for the various #TeamJAF races coming up this spring, and lining up our first ever NYC event (more on that later). But that’s not everything that kept JAF busy in November – read all about the month that was, below! Gratitude Gala A Record Success! It’s still hard to believe we just celebrated our eighth annual gala earlier this month. A lot can happen in eight years, and we have been repeatedly blown away by the incredible generosity of our supporters – led, of course, by our Presenting Sponsor, East Commerce Solutions, Inc.
Because of your collective kindness, we are THRILLED to announce that the 2015 Gratitude Gala set a new fundraising record – raising more than $900,000 along the way. The theme of this year’s gala – Above and Beyond – truly came to fruition, as the gala has now exceeded its previous fundraising record in each year of its existence.There are so many we would like to thank who made the Gala night so special, including Presenting Sponsor East Commerce Solutions, Inc., and its fearless leaders – Ed and Lisa Medeiros – who we were honored to present with the 2015 Gratitude Gala (Up)Beat Award. We also want to send a huge thank you to our Platinum Sponsors: CVS Health, The Kraft Group, and Takeda Oncology; the Patriots players and New England sports stars and celebrities who came out to the event; and the Kraft family and Gillette Stadium, for welcoming us into this fantastic venue once again. We can’t say enough about our incredible friends at ALEX AND ANI® – Gold Sponsors of the Gala – who generously donated their resources towards creating a beautiful video presentation to share with our attendees, which highlighted one of our young patient recipients named Cole. We feel humbled and blessed to be part of such a strong and supportive community dedicated to helping others in need, and we look forward to continuing our upbeat adventures with all of you down the road! Click here to read the full recap on our blog. We also want to thank Patriots co-captain and cancer survivor Nate Solder, our keynote speaker, for bravely sharing his own experiences with cancer – including the recent diagnosis of his three-month-old son, Hudson, which was revealed to our gala crowd. 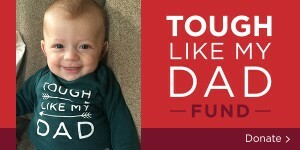 Nate, a testicular cancer survivor, and his wife, Lexi – both long-time supporters of JAF – have asked that those wishing to support Hudson’s battle make a donation towards the Joe Andruzzi Foundation’s Tough Like My Dad Fund, appropriately named after the adorable photo of Hudson the Solders shared with the gala audience. Proceeds of the Fund will benefit JAF’s mission of providing financial assistance to cancer patients and their families – allowing them to focus on recovery, not mounting rent/mortgage, utility or other household bills. For the second time ever, we’re sending Team JAF runners to the streets of Manhattan on Sunday, March 20, 2016 for the United Airlines NYC Half Marathon – and we want YOU to come along for the ride (or, run)! The race will take Team JAF runners on a 13.1-mile tour of NYC, stopping traffic in Manhattan, from Central Park through Times Square to South Street Seaport – all to raise funds in support of JAF’s mission of providing help, hope, and a reason to smile for cancer patients and their families. Already have a NYC Half qualified or invitational entry and want to fundraise for charity? You can join Team JAF as well! Visit our events page to read all about it! To apply, please click here to complete our 2016 NYC Half Marathon application. The Joe Andruzzi Foundation invites our New York-area supporters to join us on Tuesday, December 15 (6:00 p.m.) for an evening of cocktails and conversations in Manhattan as we introduce ourselves to one of our most rapidly growing patient communities. Though our foundation’s roots are based in Massachusetts, New York (and the greater tri-state area) is a very special place for JAF – Joe grew up on Staten Island, and spent his formative years at Tottenville High School in Huguenot. 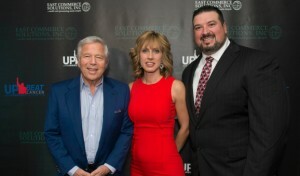 The event – hosted at NYY Steak’s Manhattan location (7 West 51st Street) – will give our New York supporters a chance to hear directly about the Joe Andruzzi Foundation from its President, Joe Andruzzi, and Executive Director, Jen Andruzzi, along with area patient recipients the Foundation has previously assisted. Proceeds from tickets to the event – sponsored in part by Bob’s Discount Furniture and Takeda Oncology – will benefit the Foundation’s mission of providing help, hope, and a reason to smile for cancer patients and their families by contributing financial and emotional support when it is needed most. Now in its fourth year, #GivingTuesday is a global day of giving fueled by the power of social media and collaboration. Observed on the Tuesday following Thanksgiving (December 1 this year), #GivingTuesday kicks off the charitable season when many focus on their holiday and end-of-year giving. The “pay it forward” mantra is deeply embedded into the fabric of our Foundation, and we hope you’ll join us in supporting cancer patients and their families by making a donation to the Joe Andruzzi Foundation tomorrow in honor of #GivingTuesday. On Monday, April 18, 2016 – Marathon Monday – the Joe Andruzzi Foundation’s “Team JAF” runners will take strides against cancer at the 2016 Boston Marathon® for the sixth straight year. 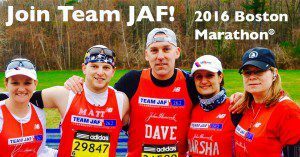 We are currently accepting applications for those interested in running for Team JAF. We welcome those seeking a charity bib, as well as runners anticipating to receive entries through qualification or outside invitations. Click here to submit an application. Visit our events page to learn more. 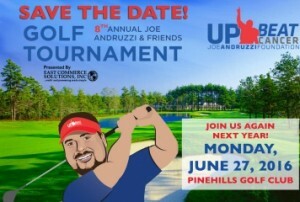 The Joe Andruzzi Foundation’s will return in 2016 to the beautiful Pinehills Golf Club in Plymouth, MA for our 8th annual Joe Andruzzi & Friends Golf Tournament, presented by East Commerce Solutions, Inc. Check back in early 2016 on our events page for details on foursomes. For questions regarding sponsorship opportunities, please contact events@joeandruzzifoundation.org. On Saturday, November 21, Jenelle “Nelly’ Camara – a JAF patient recipient and incredible upbeat ambassador – passed away at the young age of 17.Nelly, a beloved cheerleader and softball player at Durfee High School in Fall River, MA, had been battling Ewing’s sarcoma since January 2014 and was the subject of our JAF Patient Profile series earlier this year. Nelly was such a bright light for so many people in her life, and we hope you will join us in sending thoughts and prayers to her family in this difficult time.